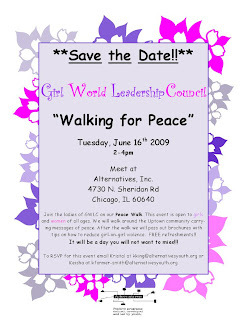 Peace Walk Reviewed by Edgeville Buzz on May 28, 2009 . On Tuesday June 16th, Girl World Leadership Council will host a Peace Walk against violence in the Uptown neighborhood. Girls and women from Edgewater are welcome to join! Our contact at Alternatives, Inc. was kind enough to notify us of this upcoming event. You should check it out, man. On Tuesday June 16th, Girl World Leadership Council will host a Peace Walk against violence in the Uptown neighborhood. Girls and women from Edgewater are welcome to join! Our contact at Alternatives, Inc. was kind enough to notify us of this upcoming event. You should check it out, man.